"By far my favourite version of Holmes"
When the body of a fan is found dead in the middle of the pitch ahead of a Europa League match, the police cordon off the Riverside Stadium refusing to open up the gates until the perpetrator is found. Holmes and Watson face a race against time to unravel the mystery and ensure the match goes ahead. The Riverside Thriller was originally published as a serialisation in the Middlesbrough FC fanzine, Fly Me To The Moon, across the inglorious 2016/2017 Premier League campaign. Holmes and Watson are both die hard Middleborough footie fans in this hugely witty and enjoyable 're-boot' of the legendary duo. A murder in the centre circle of the Riverside Stadium with lots of knowing references to the town, the club and Indie Rock leaves one with a warm feeling of satisfaction and a 'perma-grin'. Great fun...by far my favourite version of Holmes...thankfully one of a series. Well done indeed Mr Small. 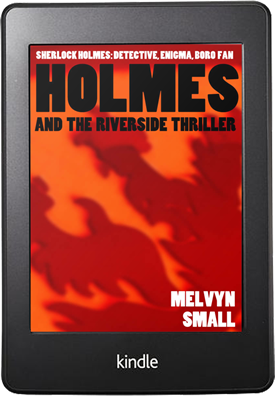 Holmes and the Riverside Thriller is available from Amazon on Kindle eBook.